The Trust consists of three to five members of CFUW/Kanata, who are appointed by the Club’s executive for a three-year term which is renewable for a second term. 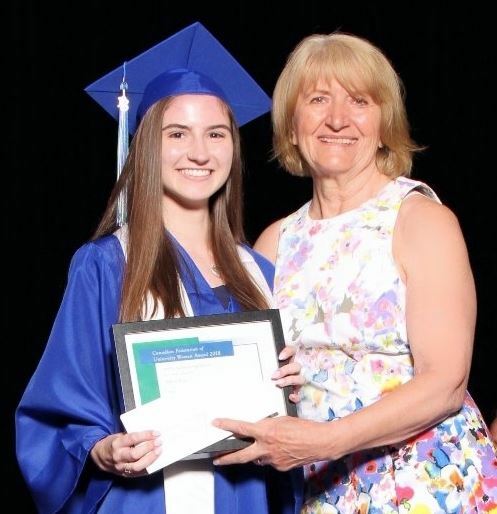 Each year, CFUW Kanata awards scholarships of $1,000 each to women graduating from local high schools who will be attending a Canadian university or a provincially-funded college. Each of the nine local high schools in Kanata, Stittsville and West Carleton is asked to accept and assess applications of female students in their school who will be attending either university or an accredited post-secondary college in the Fall. Each school selects one student for a $1,000 award. Applications are assessed with consideration of the student's need for financial assistance, her prior community involvement, her ability to overcome great personal challenges, and her acceptance to a university or college of her choice. The Trust receives its funding through donations and bequests from Club members and others, as well as from CFUW/Kanata fundraisers. Donations of $10.00 or more are tax deductible. To see our most recent Scholarship Winners, click here.